Marketcircle, makers of Billings and Daylite for the Mac, has announced Billings Pro. As its name suggests, this upcoming version of Marketcircle’s time tracking and invoicing app will bring some big new features to the table, and you can help test and perfect them. According to Marketcircle’s teaser site, Billings Pro is designed for small-to-medium sized workgroups and will feature things like multi-user time tracking and billing. Users will be able to track time and expenses “anytime, anywhere, with or without a server connection,” and a stated focus on “the mobile future” even hints at an update for Billings Touch. An iPad client could even be on the to-do list. Marketcircle also says it’s time to invite a new batch of beta testers. If you are in need of a workgroup-centric, multi-user billing system, and if you are hip to the test-break-and-report-bugs beta scene, you can sign up at this Google Docs spreadsheet linked from the teaser site. Fair warning, though: it might be a month or two before the doors official open for testers. As for a price or shipping date, Marketcircle is hush for now. 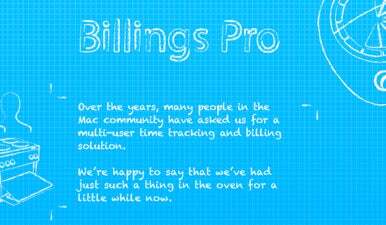 The only other detail the company shares is that Billings Pro will require Mac OS X 10.6 Snow Leopard.